SnapSports, the industry leading manufacturer and provider of premium modular sports surfacing and athletic courts, is the official championship flooring for this year’s Volleyball Festival championship games. The 28th Annual Volleyball Festival has over 7000 female competitors and is one of the largest women’s volleyball tournaments in the country. Approximately 550 teams with girls ages 12-18 will compete in seven different age divisions at the Phoenix Convention Center from June 23-27, 2011, 131 of which will be from Arizona. Past participants have included former Olympians Kerri Walsh, Misty May, Heather Cox, Kristin Folkl, Holly McPeak, Tara Cross-Battle, and Kelli Tennant. The championship courts feature the multi-patent SnapSports ShockTower® flooring, the most top rated modular volleyball court system worldwide. “To have our volleyball surfaces chosen above all others for the world’s top volleyball players to compete on makes all of us at SnapSports proud, and is a true testament to the unmatched performance the SnapSports ShockTower® sports flooring delivers” said Jorgen Moller, CEO, SnapSports. The SnapSports patented ShockTower® surfacing the athletes will compete on, is the industry’s first and only modular volleyball flooring system to incorporate a patented absorbent sub-structure and is the industry’s most advanced suspended modular sports flooring. ShockTower® surfacing has a multi-patent design, which features a resilient shock technology that offers excellent impact control and rolling support for added level of player safety and superior performance. “We are very pleased to have worked with the SnapSports team and to have top players from around the world play on the SnapSports volleyball surface during our 28th year of the festival, the player and coaches love to compete on SnapSports volleyball courts” said Bernice Epperson – CEO of Festival Sports, Inc.
SnapSports®, the industry leader in modular sports surfacing, will be the official floor of the 43rd USA Team Handball National Championships, to be held May 13-15, 2011, at the Salt Palace Convention Center, in Salt Lake City, UT. SnapSports Athletic Surfacing, the industry leader of the modular sports surfacing industry, will provide the official flooring for the 43rd USA Team Handball National Championships, being held May 13-15, 2011 at the Salt Palace Convention Center, in Salt Lake City, UT. The three-day tournament, will feature competition in three different divisions, for which all of the games, will take place on SnapSports®, patented BounceBack® surfacing, manufactured specifically for durability during competitive play. By the end of the event, two teams will walk away as the 2012 Men’s and Women’s Championships. The 43rd USA Team Handball National Championships, notably the biggest weekend in American Handball, will be held for the first time in Utah, and has been welcomed with open arms by the Utah Sports Commission. All of the games at this National event will be played on SnapSports® multi-patented sports surfacing. 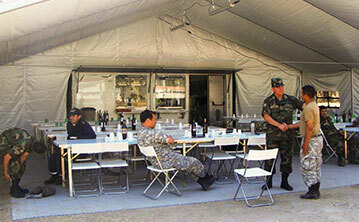 SnapSports® Athletic Surfacing, is the industry leading manufacturer of high-performance modular sports surfaces. SnapSports® patented BounceBack® surfaces, are designed specifically to accommodate aggressive play using patented Shocktower® technology, which provides superior shock absorption, and eases the impact on joints, creating a safer playing surface for athletes. “We are delighted to continue our partnership as the official flooring of USA Team Handball. Our multi-patented surfaces, combine patented shock absorption technology with traction and control features, to meet the unique demands of the sport, which is why for handball, no other surface comes close.” Jorgen Moller, CEO, SnapSports®, Inc.
Utah will become the 17th state to host the Nationals event, which was originally held in 1968 in Long Island. The selection of Salt Lake City as the host city was not surprising, as USA Team Handball’s national governing body recently moved and established its headquarters in Utah’s capital city in 2005. SnapSports® will provide 20 championship basketball courts for the Pacific AAU Girls District Championships April 30 – May 1, 2011. SnapSports Athletic Surfacing has been chosen as the preferred flooring of the Oscar Jimenez Pacific AAU Girls District Championships. This event will commence at the Reno-Sparks Convention Center in Reno, Nevada, April 30 – May 1, 2011. 20 high-performance Basketball courts will be provided by SnapSports, ideal for tournament play, for the duration of the games. Jam On It – All Under One Roof Basketball Tournaments now enters its 20th year of tournament hosting. 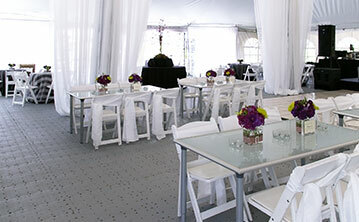 Many widely recognize it as one of the premier tournament event operators in the country. For the 10th consecutive year, Jam On It–All Under One Roof will host the Pacific AAU Basketball Girls District Championship. This event serves as the AAU National Qualifier for the Pacific District, which has one of the largest AAU memberships. The qualifier also serves as an opportunity for coaches and players to come together and celebrate girls basketball. All of the games during this two-day tournament will play on SnapSports multi-patented athletic courts. Because of the quality, SnapSports is the preferred flooring of Jam On It – All Under One Roof Basketball Tournaments. “The Flooring is awesome, (the players) love it, the way you install it, the way you clean it, the way we set-it up, it’s second to none,” said Matt Williams, tournament director of Jam On It –All Under One Roof Basketball Tournaments. 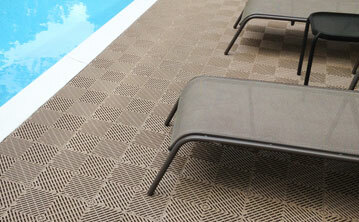 SnapSports Athletic Surfacing is the industry leading manufacturer of high-performance modular sports surfaces. SnapSports designed BounceBack® surfaces to accommodate aggressive play using patented Shocktower® technology. This technology provides superior shock absorption and eases the impact on joints, therefore creating a safer playing surface for athletes. “We are excited for the opportunity to continue our long standing relationship with this outstanding organization, and provide the type of high-performing sports floor these young athletes need to perform at the top of their game,” said Jorgen Moller, CEO of SnapSports®, Inc. The 2011 Pacific AAU Girls District Championships are also adding special events to this year’s tournament. For example, there are games for coaches to participate in, free throws and three point shoot outs for the players and parents. Salt Lake City, UT (PRWEB) March 19, 2011–Utah Business Magazine has selected Jorgen Moller, CEO of SnapLock Industries®, world’s leading manufacturer and supplier of modular flooring products, as one of 2011’s ‘CEO of the Year’ honorees. The publication’s annual ‘CEO of the Year’ issue recognizes CEO’s from all over Utah, who have exhibited successful leadership and have taken their businesses to the next level in growth and revenue. “The eight professionals being honored in 2011 exude innovation, show sound business judgment and have seen proven financial success. Whether in the private, public, government or nonprofit sector, these individuals have proven to be successful leaders within their companies and their communities.” – Utah Business Magazine. Jorgen Moller, as CEO of SnapLock Industries® since 1997, has led the company to experience an over 50 times growth in revenue. Other prior recognitions and achievements include: Ernst & Young ‘Entrepreneur of the Year’ finalist, Utah Business’ Top 100 Fastest Growing Company’s and INC’s 500/5000 list, to name a few. “I am honored to be recognized by Utah Business Magazine. The credit should really go to everyone at Snap Lock who made Snap Lock the industry leader it is today.” – Jorgen Moller, CEO, SnapLock Industries®. Utah Business Magazine will honor the eight CEO of the Year honorees at a luncheon at the Grand America on March 23, 2011. Each honoree will also be profiled in the March Issue of Utah Business Magazine. The 2011 Colorado Crossroads National Qualifier, March 12-14, 18-20, 2011, in Denver Colorado, has chosen to play their championship games on SnapSports® Volleyball Flooring, featuring the multi-patented Bounceback® Shocktower® shock absorbing technology. The Colorado Crossroads National Qualifier is the nation’s second largest indoor Volleyball event, held over two weekends in Denver, CO. At the 2011 event, in it’s 26th year of operation, the tournament will host over 12,000 players competing on 1,100 teams, all playing on SnapSports Athletic Surfacing, the preferred modular volleyball surface of top athletes and coaches worldwide. SnapSports Volleyball Surfacing, featuring the patented Bounceback Shocktower Technology, incorporates an exclusive absorbent sub-structure designed to ease joint impact, with player safety and performance in mind. “We are very excited to have our SnapSports Athletic Surfacing, chosen as the Championship Flooring of the Colorado Crossroads National Qualifier” – Jorgen Moller, CEO, SnapSports, Inc.
RaceDeck garage floors, the world’s leading garage flooring manufacturer and supplier has been named the ‘Official Preferred Garage Floor Of the GoodGuys Rod & Custom Association for 2011’. GoodGuys® is the world’s largest Hot-Rod association with nearly 100,000 members. 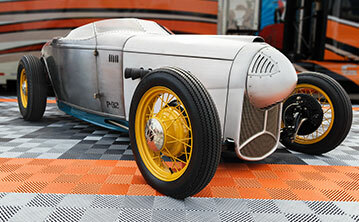 “ Everyone at RaceDeck loves the GoodGuys Rod & Custom Association, it’s in our blood. The people and their cars are what we are all about and we’re proud to be part of such a world class organization,” said Jorgen Moller, CEO of Snap Lock Industries -The manufacturer of RaceDeck® garage flooring. 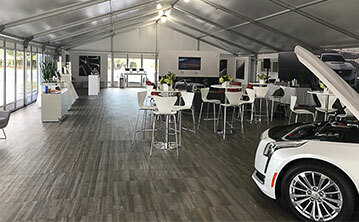 RaceDeck garage flooring is recognized as the worlds leading manufacturer and supplier of residential & commercial garage flooring, as well as portable display flooring. The introduction of RaceDeck garage floors pioneered the modular garage flooring industry you see today, They are the ‘original’ modular garage flooring company. With RaceDeck being the world’s premier garage flooring manufacturer and GoodGuys’s being the leader in their industry, it was the obvious choice for GoodGuys to name RaceDeck the ‘Preferred Garage Floor’. “The enthusiasts at GoodGuys build and own some the highest quality rides in the world. You will find that the same American Made quality and pride goes into every RaceDeck floor we sell, that is why we are the #1 choice of the GoodGuys members,” sad Moller. Goodguys offers over 20 car show events annually across the country from the West Coast to the East Coast and all points in between. The events range from two-day affairs attended by 30,000 to 40,000 people to three and four day extravaganza’s attracting over 100,000 auto enthusiasts. If you want to see some of the coolest hot rod and street rod creations in the world, be sure to attend one of these events. The 2nd annual Big Apple Handball World All-Stars Tournament will commence this January 1-2, 2011 In New York City’s Riverbank State Park Pavillion. Top professional teams will compete on multi-patented SnapSports® ShockTower® Team Handball sports flooring, also the official flooring of the United States Futsal Federation (USFF). 159 Nations and 39 million people play Handball, widely known as Team Handball in the United States. Many people link elements of basketball, soccer and lacrosse to the sport. Because of this, it is fast, physical and exciting. Competition involves two teams with six players and one goalie each. Teams also face off on a court approximately 66 by 131 feet. Players dribble, pass and shoot a ball into a goal. It is a very fast, exciting and aggressive player-on-player contact sport. SnapSports® designed the Bounceback surface to absorb player impact during aggressive play. The tournament will showcase World All-Stars Vs. German All-Stars with some of the greatest names in Handball, such as Jackson Richardson, HANS Wislander and MIRZA DZOMBA, to name a few. This is an event not to miss. “We are really excited to have our SnapSports® athletic surfaces chosen above all others as the official flooring of USA Team Handball and to be part of such a world-class event.” Said Jorgen Moller – SnapSports. The premiere episode of DIY’s ” The Vanilla Ice Project ” will feature RaceDeck Garage Floors, leading manufacturer and supplier of premium modular garage flooring worldwide. The show’s host is pop icon Vanilla Ice, best known for his ’90s music. 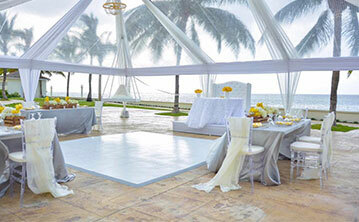 He also brings more than 15 years of home improvement experience to this 7,000-square-foot Palm Beach mansion. Vanilla Ice (aka Robert Van Winkle) and his crew of contractors get down to business and renovate a different room of the home, including the garage where RaceDeck is the garage floor of choice. The first season of ” The Vanilla Ice Project ” is based around the makeover of this home in Palm Beach. 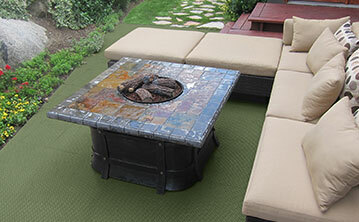 Built to withstand tough garage environments, RaceDeck flooring is the ideal way to turn a garage into a showplace. Ultra-durable flooring will withstand greasy spills and rolling loads of 80,000 pounds, so you can be sure you’re getting the best. 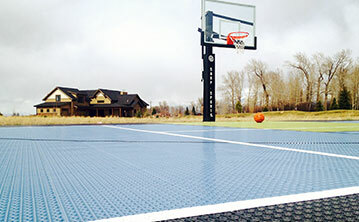 SnapSports® ShockTower® custom basketball court at his residence in Salt Lake City earlier this month. 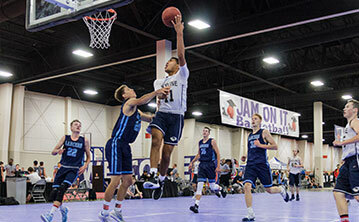 The Amateur Athletic Association (AAU), one of the world’s largest volunteer sports organizations, is hosting its West Coast National Championships July 22-25 at the Las Vegas Convention Center and has chosen SnapSports®to provide the athletic surfaces for the championship basketball courts. 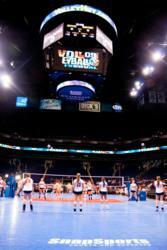 During the AAU West Coast National Championships, athletes from ages 7 to 17 will compete on more than 45 courts. These courts feature 100,000+ square feet of SnapSports BounceBack® sports surfacing. 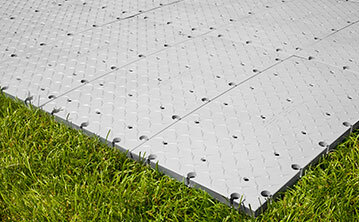 Each square foot of the patented BounceBack surface contains over 1,000 shock absorbers. This provides the highest level of ‘cush’ for high impact competitive play as well as superior ball performance. “The AAU is such a great organization. We’re beside them in their goal to promote amateur sports and all the fun, camaraderie and health benefits they bring. Our BounceBack flooring is a perfect fit for the AAU – it’s easy to install, works for dozens of sport and provides unmatched performance & safety for these top amateur athletes to compete on,” said Jorgen Moller, CEO of SnapSports. 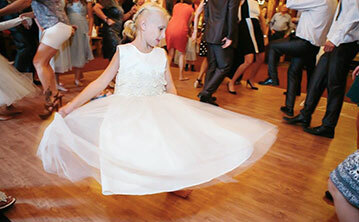 The AAU is also one of the largest non-profit volunteer sports organizations in the United States. A multi-sport organization, the AAU dedicates itself exclusively to the promotion and development of amateur sports and physical fitness programs.